﻿ Will a Welcome Peace Derail Colombia’s Sustainable Development Plans? In August 2012, Colombian President Juan Manuel Santos began negotiations with the Revolutionary Armed Forces of Colombia, also known as the People’s Army, or FARC, that resulted in a general peace agreement. It is expected the agreement will end the long-running conflict between FARC and the government, which will have profound effects on rural areas of the country. With more than 300 different ecosystems, Colombia is one of the world’s megadiverse countries. It is home to nearly 10 percent of all living species and has more bird and orchid species than any other country. It is second in the world in the diversity of plants, amphibians, freshwater fish, and butterflies. During the conflict with FARC, some biodiversity areas were affected by landmines, deforestation (from illicit crops and mining), and the wide use of glyphosate herbicide to destroy illegal coca crops in rebel-controlled areas. But, paradoxically, many biodiversity hotspots were protected from development by their proximity to the violence. Almost all of the important biodiversity areas have been used for guerrilla recruitment and seen large numbers of displaced people. With peace now at hand, this “protection” is being lifted and there is worry about the environmental consequences. This is not to say peace is unwelcome – far from it! Indeed I hope this agreement may motivate the other large guerrilla group, the National Liberation Army, or ELN, to follow. But Colombia must take steps now to preserve its ecological heritage and plan for long-term sustainable development, crucial in adapting to climate change. Colombia is an emerging economy, averaging more than four percent annual GDP growth for more than a decade. However, more than 30 percent of the population still lives below the poverty line. The government has been trying to come up with a strategy that brings together social, economic, and environmental sustainability. For the majority of people, agriculture is still the primary means of making a living, and peace may result in a large number of farmers returning to rural areas and clearing new land. Infrastructure development, greater access to markets and capital, and agricultural development are all expected in many new parts of the country. As well, guerrilleros recruited at an early age (voluntarily or forcibly) will need guidance and opportunities for sustainable livelihoods or they may return to growing coca or illegal mining. When it comes to climate change and conflict, we usually think about how the latter will be created or exacerbated by the former. In Colombia, before answering this question, we need to understand how peace will affect climate change. Colombia’s biodiversity comes at a cost. Its geography can be extreme, and our economy is largely dependent on natural resources and easily affected by extreme weather events. These characteristics make the country very vulnerable to the effects of climate change. For this reason Colombia has been a proponent of including not only mitigation efforts in Intended Nationally Determined Contributions (INDC) to the UN Framework Convention on Climate Change, but adaptation strategies. According to Colombia’s latest proposed INDC submitted before the Paris conference, 11 territorial adaptation plans have been completed and 100 percent of the country will have plans formulated and implemented by 2030. The INDC also proposes a national system of adaptation indicators that will guide monitoring and evaluation of these adaptation measures, and water resource management tools for the country’s priority water basins. Other commitments include adaptation planning for the six sectors of the economy (transportation; energy; agriculture; housing; health; and trade, tourism, and industry); awareness and public education strategies; new technical working groups on climate and agriculture; and an increase in protected areas by more than 2.5 million hectares, including the páramos, unique ecosystems found between 2,500-3,600 meters above sea level in only six countries in the world. Another previous commitment involves achieving zero net deforestation in the Amazon by 2020. Though Colombia has been recognized as a climate change leader for these efforts, we are not very good at achieving differential approaches – that is, the understanding that everyone is not affected the same way and not everyone has the same capacity to respond. Colombia’s status as a low emissions country is in part a result of high inequality. A big part of the country simply does not have access to electricity. As development opens up in newly stable areas and displaced people return, these figures will likely change, shifting the country’s emissions trajectory. The challenge is clear: Colombia’s adaptation and mitigation strategies need to consider the return of displaced victims and newly demobilized fighters from the FARC conflict, as well as a new wave of development that may follow. These population movements will put new pressures on many different systems. The government has in many respects done a commendable job on climate change, but as we say in Colombia, el papel lo aguanta todo – “anything can be said on paper.” How its commitments will be implemented is a major question, not to mention monitoring the long-term impacts of current policies or evaluating the sustainability of the process from a human perspective. How grounded in this reality are our many adaptation plans? How useful will they be for the poorest and most marginalized, including those in former conflict zones? How are they transforming the underlying circumstances that foster inequality? How are these feeding into new programs that aim to reduce vulnerability and enhance adaptive capacity? As Colombia emerges from dark days, these are important questions to consider. Rocio Rodriguez Granados is a member of the Global Resilience Academy, a five-year research project sponsored by the Munich Re Foundation, International Center for Climate Change and Development in Bangladesh, and United Nations University, and a PhD candidate at the University of Georgia working on the livelihood implications of climate change for indigenous communities in the Colombian Amazon. Sources: BBC, Convention on Biological Diversity, Economic Commission for Latin America and the Caribbean, Happy Planet Index, Inter-American Development Bank, Ministry of the Environment (Colombia), National Parks of Colombia, UN Development Program, The World Bank. 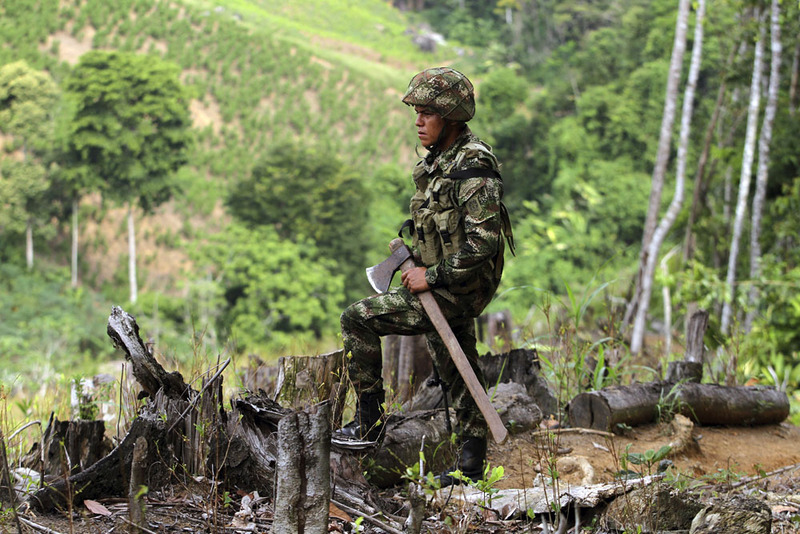 Photo Credit: A soldier of the Colombian Army looks on during a coca eradication operation in northeastern Antioquia, September 3, 2014, courtesy of Fredy Builes/Reuters.